The safety of the indigenous tribes of the Chittagong Hill Tracts in Bangladesh’s Bandarban and Rangamati districts is said to be extremely fragile after a build-up of tensions during 2016. According to the PCJSS, the heightening of tensions has been exacerbated by a series of conspiracies and political intimidation created by the Awami League and assisted by the local administration and security forces, leading to extreme violence and the deaths of two members of PCJSS. 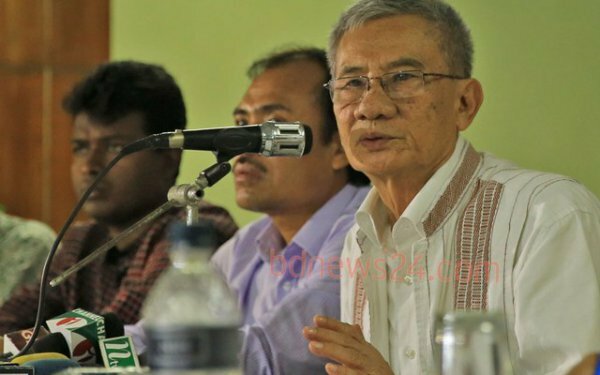 The ruling party Awami League went on hatching conspiracy and upholding baseless pleas alleging that it had been due to ‘threats of terrorists’ the AL candidates were unable to submit their nomination papers in various UPs under Rangamati Hill district since declaration of the schedule for holding election in the UPs in the district. With a view to destabilizing the situation in CHT and directing the UP election towards different course, AL organized a so called anti-terrorist gathering in Rangamati town on plea of stopping extortion and terrorism and recovery of the illegal arms on 24 March 2016. Shanti Tripura (35), PCJSS member and an independent chairman candidate for Ghalangya Union Parishad of Ruma Upazila was abducted in the morning of 19 April 2016 from his house at Ramdupara and killed in the jungle adjacent to the Adika village. The perpetrators also set fire in his house. It was learnt that the incident was carried out with the support of AL considering Shanti Tripura to have been a strong contestant. The army surrounded Kenaijopara, a village under Noapatong Union of Rowangchari upazila of Bandarban Hill district, and held and beaten up Thoaiching Maung Marma and Maung Bu Se Marma, the uncontested UP members, on 19 April 2016. Besides, they also held up five supporters of Thoaiching Maung Marma, intimidated them and pressurized them to file false case against Thoaiching Maung Marma. Afterwards, showing them as witnesses, a fabricated case was filed by the AL-supported chairman candidate against the PSJSS-supported chairman candidate. During elections in the 25 UPs under the 3rd phase on 23 April 2016, the local AL resorted to wide-scale forgery by supplying hundreds of fake ballot papers to their workers and supporters who got the ballots inserted into the ballot box during casting of their votes. The AL-nominated UP chairman and member candidates were illegally declared to be winners through validating the fake ballot papers by the administration, election commission and the officials deployed for election duty. The Chatra League terrorists, having been signaled by the AL, attacked upon the PCJSS and Pahari Chatra Parishad (PCP) workers including the polling agents of Chaching Maung Marma, an independent chairman candidate of Gajalia Union under Lama upazila in Bandarban district on 25 April 2016. At this, one PCJSS member and two PCP members sustained serious injuries. On 31 May 2016, Subil Chakma, Information & Publicity Secretary of Kibuk Para branch of CHT Juba Samiti in Kualong Union of Bandarban Hill district was killed at the wee hours at night. It came to be known that the killing incident occurred with the AL support following hot exchanges with them during the election campaign before. With a mean objective to flow the killing incident to different direction and thereby to make a safe crossing over the election hurdle, upon hatching conspiracy in collaboration with the AL, a false case was filed against four members of Juba Samiti and one Maigya Marma amongst them was taken arrested. It was learnt that an emergency meeting of Bandarban District Awami League was held at the office of Bandarban Hill District Council's chairman on 3 July 2016 in which it was decided that the PCJSS leaders and workers would be depleted in the name of extortion of money, killing and kidnapping. This said decision has been post to Face Book status of AKM Jahangir, leader of Awami League Bandarban District Committee. The face book status also contains Kyaw Shwe Hla’s declaration that the leaders and workers of PCJSS and PCP would punish and none of them would be spared any more. On the other hand, the Minister of State and MP Bir Bahadur Ushwe Ching, while talking to PCJSS leaders in the Ministry of CHT Affairs, openly threatened by saying: ‘K.S. Mong and PCJSS leaders would not be spared.’ Such irresponsible and reckless words uttered by Bir Bahadur while being positioned as the State Minister in the CHT Affairs Ministry can never invoke well being result. The main objective of conspiracy, fascist repression and political intimidation being meted out by the local Awami League and administration against the members of PCJSS and its wing organizations is to flow the mass anguish and discontentment towards the ruling party for anti-accord and anti-Jumma interest activities of the local AL leaders and not implementing the CHT Accord by the ruling party to different direction. If the fascist moves on part of the government agencies continue in this way, the situation would bound to develop from bad to worse. For any undesirable situation that might appear as the outcome, the Awami League leadership including the State Minister Bir Bahadur, Bandarban Hill District Chairman and District Awami League President Kyaw Shwe Hla. Hence, stop this model of conspiracy, fascist repression and political harassment against the members of PCJSS and its wing organizations with immediate effect and let the concocted and fabricated cases filed against them be withdrawn at the soonest. In conclusion, PCJSS longs for kind interference of the Awami League central leadership in the critical situation that has been created in Bandarban by the District Awami League leadership including the State Minister Bir Bahadur Ushwe Sing.